This figure pack invites you to unleash the uncompromising resilience of the Echo Base Troopers on any battlefield. Two sculpted plastic figures bring the characters to life and replace the tokens found in the Return to Hoth expansion. 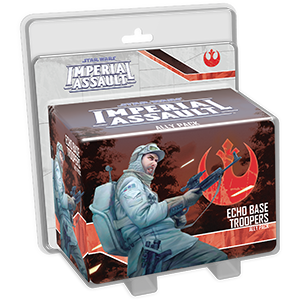 With a new campaign side mission, two new skirmish missions, and new Command cards and Deployment cards, the Echo Base Troopers Ally Pack can help you hold the line against any Imperial forces. This is not a standalone product. A copy of the Imperial Assault Core Set is required to play. Includes missions that require the Return to Hoth expansion.